Keeping pace with the current world Shree Mahila Hithwardhak Mandal has continued its growth by addressing the community with new and wide variety of social services. 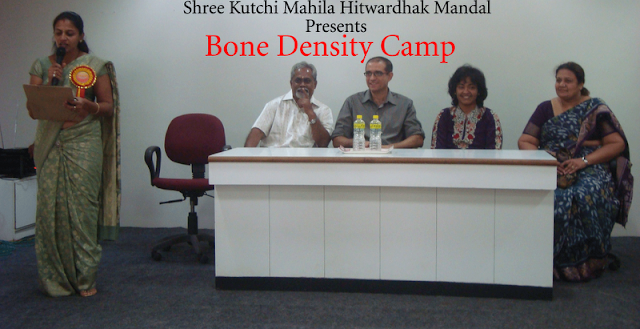 Dr. Sandeep S. Neeralagi addressed the camp members and shared a very valuable knowledge about bones, the ways of treatment, exercise needed and many other factors which helps the people to stay safe and healthy. The Doctor also consulted each and every one personally after all the 150 members were screened in BMD Machine. Dr Sandeep, through his lecture created awareness among the patients about the precautions to be taken for leading a healthy life-style. He stressed that usage of tobacco, smoking, drinking should be avoided and healthy diet, physical exercises and walking should be compulsorily time tabled on the daily routine. The Doctor and his paramedical staff examined the whole camp where detailed instructions were given to every person. The computerized machine was brought by officials of Novarties India Ltd. The scan was done by placing leg on the machine after which computerized report is generated.